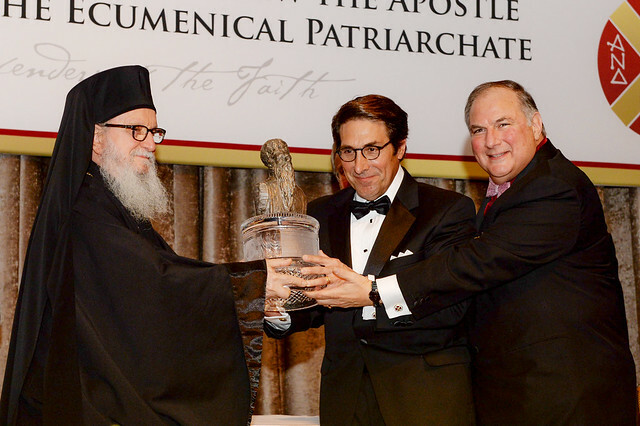 New York, NY - His Eminence Archbishop Demetrios of America, Exarch of the Ecumenical Patriarchate, together with the Order of Saint Andrew's National Commander Dr. Anthony J. Limberakis presented the Athenagoras Human Rights Award to the Jay Alan Sekulow, PhD, JD. Dr. Sekulow is the Chief Counsel of the American Center for Law and Justice and the European Centre for Law and Justice. The Award was presented during the annual Athenagoras Human Rights Award Banquet held at the New York Hilton Hotel on October 19, 2014, with some 500 Archons and guests in attendance. In presenting the Award, National Commander Limberakis, paid tribute to Dr. Sekulow, one of the world's leading lawyers and human rights defenders, saying, "This evening we honor an individual who has dedicated his life to fighting for fundamental human rights and religious freedom in the international juridical arena, from the Supreme Court of the United States to the European Court of Human Rights. His clarion voice has been one calling on governments who victimize their religious minorities by constricting their inalienable rights to cease and desist such pernicious policies by court order." For nearly a quarter of a century, Dr. Sekulow has been on the front lines - working to protect religious and constitutional freedoms in the courts, in Congress, and in the public arena. Dr. Sekulow is a best-selling author (Rise of ISIS: A Threat We Can’t Ignore), a popular guest on nationally televised news programs and a frequent contributor to national publications including USA Today, The New York Times, The Los Angeles Times, The Washington Post, and the Washington Times. For many years and on innumerable occasions, he has supported and championed the cause of the Orthodox Christian world by his endeavors on behalf of the Ecumenical Patriarchate of Constantinople and the Patriarchate of Jerusalem. Dr. Sekulow spoke at the Second Archon International Conference on Religious Freedom that took place in Berlin last December. He is a courageous and indeed fearless spokesman on behalf of the Judaeo-Christian values that form the bedrock of American society and that are now so virulently under attack. Established in 1986, the Athenagoras Human Rights Award is given in honor of Ecumenical Patriarch Athenagoras, who served as Archbishop of the Americas for 18 years before being elected Ecumenical Patriarch in 1948. He was universally acknowledged as a visionary leader and worked for peace among Churches and people throughout his life. Previous recipients of this prestigious Award have included President Jimmy Carter, President George H.W. Bush, President Mikhail Gorbachev, Elie Wiesel, Archbishop Desmond Tutu, Mother Teresa, Archbishop Demetrios of America, Archbishop Iakovos, and Theodore Cardinal McCarrick, and last year's recipient 60 Minutes as Jeff Fager, Chairman and CEO of CBS, accepted on behalf of television program.